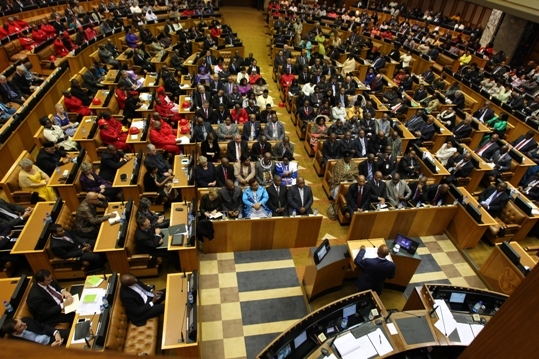 In plenary sessions of the National Assembly and the National Council of Provinces, the quality of debates has not represented high-level engagements between parties, generally failing to provide imaginative political leadership to the nation. Very often, speeches of the ruling party have been formulaic and fawning over whoever has been leader at the time. Under all presidents, parliamentary records show the tendency of ministers and MPs to preface their speeches with phrases like ‘as the President said’ in the debates. What made 2014 fundamentally different is that, instead of it being full of celebrations of the ruling party’s achievements as intended, it became a nightmarish experience for the President, who shrank from facing his parliamentary opponents. It was the year when the parliamentary opposition found a voice and a power that had not previously been exercised. But it also raised serious issues about parliament as an institution, now and in the future. There seems to be grounds to believe that legal action can be instituted to compel Zuma to account for the money, either through interdicting parliament to follow processes enjoined in its duty to secure accountability or to directly seek an order to compel the President to refund it. There may well be other paths empowering the Public Protector to secure answers or pursue other legal routes. The framework of constitutional democracy was a hard-won gain, providing a framework for politics that makes possible that which had never previously been open to South Africans. If that space closes we lose the opportunity to freely advance a progressive politics and contend and debate over meanings of any potential emancipatory outcome. Admittedly, legality will not in itself resolve a range of socio-economic issues, but without respect for constitutionalism, democratic practices in general come under threat.